Submitted by Evelyn Kiefer on Wed, 09/27/2006 - 15:02. Connect with CIA alumnus ('00) and critically acclaimed painter Dana Schutz as she presents insights on her work Thursday, Sept. 28th at 12:00 noon in Aitken Auditorium. 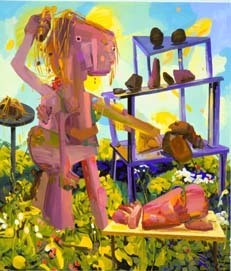 The first comprehensive solo museum show of her work, "Dana Schutz: Paintings 2002-2006," will open Friday at MOCA Cleveland. The exhibit will be on view until December 20. Her work has been shown at the Venice Biennial and MOMA and she has earned extensive coverage in/Art Forum, The New York Times and Vogue. For more information see the site for the 48th Corcoran Biennial.